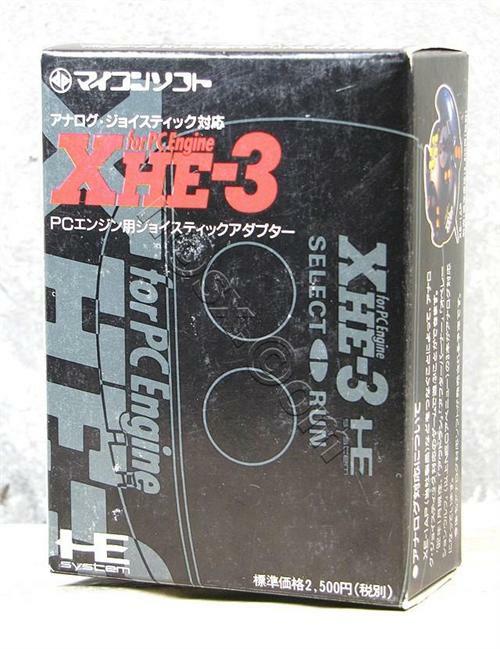 «©NCSX» Brand new and factory boxed XHE-3 MSX Controller Adapter for the PC-Engine which allows MSX joysticks and joypads to be used with the PC-Engine. Micomsoft produced a lineup of MSX controllers which were fairly popular back in the day. Instead of manufacturing a separate lineup of controllers for the PC-Engine, Micomsoft introduced the XHE-3 Adapter which bridged the MSX and PC-Engine so owners of both platforms could use a single controller on either one. The packaging lists compatibility with the Micomsoft XE-1PRO, XE-1ST2, and XE-1AP but any standard MSX controller can be used. Further, please note that Mega-Drive controllers are not fully compatible - the "B" button is not mapped but "A" and "C" work. .
NCS' remaining inventory is brand new and factory boxed in the original cardboard container. The condition of the packaging is in good structural shape but please note that there are visible signs of wear and weathering caused by decades of storage. The adapters inside are however in pristine and shiny condition. Pricing perXHE-3 Adapter is set at US$30.90 each. If you reside in the USA, NCS recommends USPS Priority shipping for the most economical domestic service. Please click on the Postal link below the UPS shipping options to display Postal shipping rates. Thanks. When the PC-Engine first debuted in Japan on October 30, 1987, it was priced at a lofty JPY24,800 or US$269.05 as of this morning’s exchange rate. New and factory boxed XE-1ST2 Joystick for the MegaDrive which is, in our opinion, one of the best sticks for the old school systems.